I read this article a few weeks ago about having a creative spirit in a corporate world, and I absolutely loved it! There have been so many times I've heard of people quitting their corporate jobs cold turkey to follow their creative dreams. Now, don't get me wrong, that is certainly ok, but it depends on how you do it and what your dream is. Is it to start your own business that you've dreamed of, or is it that you simply want to be creative and don't feel you can do that in your corporate job? There are definitely times when it is beneficial to quit and follow your passion. I have found the best of both worlds. Early on in life I felt I had a creative side to me, but wasn't sure what that was. I sucked at drawing, creative writing, graphic design, interior design, photography, and many more creative outlets. However, I knew I had a creative bone in my body. I have always known I love people and business, and that's why I pursued a degree in Marketing. I'm so thankful I did, because I truly enjoy my career! However, there have been many times in the corporate world where I have felt my hands have been tied when it comes to creativity. When you follow hundreds of creatives on Instagram (many working for themselves), it can be hard to not get caught up in thinking "Why am I not doing something like that? Why am I not working for some awesome, cool, local start up that lets me channel my creativity? Why am I not my own boss?" I know why...because I earn a good wage, have a reliable paycheck, get great benefits, contribute to my 401K and feel secure in my career's future. I'm not 100% sure I would enjoy being my own boss. I know myself, and I would be a slave to my business (which it would be owning a crepe food truck or restaurant). It's definitely nice to be able to step away from my work at the end of the day, and I know I wouldn't be able to do that if I owned my own business. However, I do see the AMAZING benefits of owning your own business so Girl Bosses...more power to you! My desire to be creative in a corporate world started when I was pursuing my MBA and working a pretty boring desk job. Because of that, I started this blog, and I can't believe I've been doing it for over 4 years. Through blogging, I have truly been able to pursue my creativity yet maintain a corporate job, and not feel the need to quit. Blogging has allowed me to become a better writer, photographer, stylist, designer, networker, DIYer, event planner and social media user. To those who are sitting in a cubicle pondering how they can be creative, find your outlet. If you can't channel your creativity in your current role, find something where you can. Maybe that's a side project with other creatives in your city. For me that was starting the ATX Blogger Mixer. This event takes months of planning, but it is so fun and rewarding. I get to use my creative skills, and I feel fulfilled. Or maybe you want to become a full time photographer, and the right answer for you is to quit your day job. Well, go ahead, but I would advise to not do it cold turkey. Take on photography projects on the weekends, start a blog/website/facebook page, get clients and make sure you are good at it and you have a support group ; ). Some people may have the luxury to quit cold turkey and try to make it work, but many people don't have that opportunity. I've got bills to pay and children's mouths to feed, and could never quit my job without lots of planning and a back up plan (or maybe I should say I wouldn't). 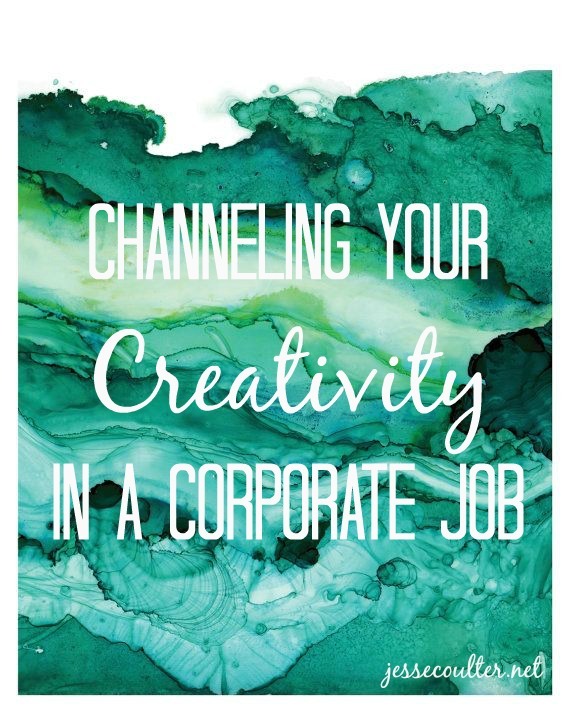 Another option if you like the security of your corporate job, is to find ways to utilize your creative skills in your company. Reach out to the advertising/art department, and ask to help with a project or create the graphics for your team's presentations. Maybe you want to do some creative writing in your role. Ask if you could contribute to your company's blog or newsletter if they have one. I understand it can be limited based on your company, but the more you want it the more likely you will find it. For me I have a goal to become part of my company's social media team and I'm working on the development to one day join that team. I also utilize my company's educational resources to take as many social media/marketing webinars and classes so I can increase my skill set in those areas. If you are thinking about a career change a few good books to read are Jon Acuff's, "Quitter" and "Do Over". If you are like me and like the security of the corporate world, don't be ashamed! You can still be creative AND sit in a cubicle. Are you currently experiencing this or have in the past?! I'd love to hear your experience.